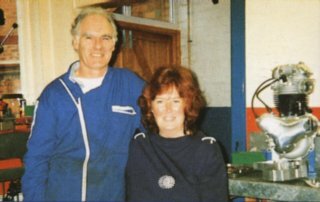 Mick Hemmings, and his wife Angie; proprietors of Mick Hemmings Motorcycles in Northampton. Mick's contact with Norton Commandos began in 1969 with the purchase of an accident damaged machine (one of the first Commandos sold in the UK). From 1970 to 1972 the machine was gradually transformed into a Norvil Production Racer and went on to win well over 30 races backed up by numerous 2nd and 3rd places, race and circuit lap records and the B.R.C. 1000cc championship. Mick opened his shop in 1974 following on from three years working for Motor Cycle News. The shop specialised in the preparation of Norton and Triumph racing machines and started to manufacture "Norvil" race parts including the disc brake, isolastic head steady, production racer fairing, tank, seat etc. Between 1974 and 1979 Mick concentrated on developing his business and raced in very few events. 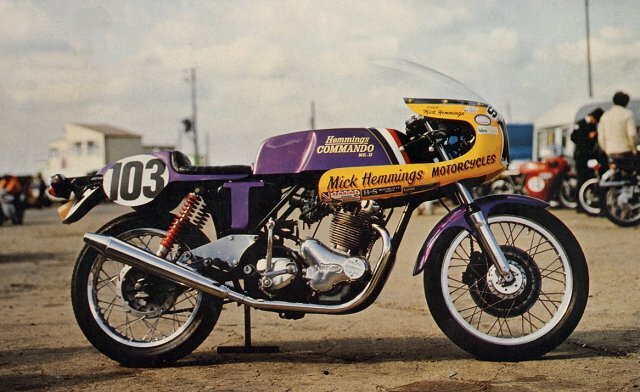 In 1980, with the emergence of classic racing, he brought his production racer out of retirement and went on to win ALL the CRMC production races he entered. He also won the won the "Classic Race of the Year" in 1982, 83 & 85 on a Rob North Trident. Mick is still racing today, finishing 12th in the 1996 Classic Senior Manx Grand Prix on the MacIntyre Matchless, a most creditable performance on a genuine classic machine.